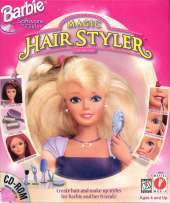 Choose either Barbie, Kira, Christie or Teresa and style her just the way you want. Customize her hair (cut, grow, curl or brush), her make-up (eyeshadow, lipstick, blush or even fun fake tatoos) and choose her clothes and accessories, all according to the party she'll be attending to tonight. Once you're done styling, watch your chosen model showing off her outfit in 3D, and you can even take pictures, frame them and print them.